It’s no secret that we love our TouchPads here at webOS Nation. We are webOS Nation, after all. Our webOS tablets see use for everything from web browsing to reading to gaming. But for some things we just had to keep reaching for our webOS smartphones - even if they were paired with the TouchPad for phone calls. One of those things was managing our to-do list in Tasks, which somehowe never made it to webOS 3.0 and the TouchPad (as we mentioned in our review of the TouchPad what seems like a lifetime ago). Despite the lack of a robust featureset in the Tasks app, we found ourselves using it quite a bit since it backed up to our webOS Profile or corporate Exchange accounts. Since this app never made it to webOS 3.x we never got the benefit of having our Tasks synced to both our phone and our TouchPad, so we were forced to rely on third-party offerings to get things done. But those apps aren't going to be supported forever, and there's something to be said for the simplicity of the webOS smartphone tasks app. But what if we could take that old Mojo-coded app and move it to our TouchPad? Turns out you can. Your first task (no pun intended) will be to download the 2.2.4 webOS Doctor. The most convenient way to do that is to head on over to the WebOS Internals wiki page and download the 2.2.4 Doctor for the unlocked Pre2. If you've got a Pre2 the Doctor's something you should probably consider just having on standby on your computer should you need it, just in case something goes awry in your daily use. You'll also need the latest version of Java on your computer, which thanks to the magic of proactive update systems on modern computers you probably already have. If you don't, you can grab the latest version of Java from Java.com. You're going to need compression software to look inside that Doctor you're downloading. Most anything will do, and there are plenty of free options like WinRAR or 7-Zip or whatever else you prefer. Now that you have downloaded the 2.2.4 Doctor, installed the latest version of Java, and have your compression app on standby, let’s grab the last bit of software you will need which is the IPK Packager by none other than webOS hacking hero Jason Robitaille. For this you can head on into the webOS Nation Forums to download. Be sure to thank Jason for his continued hard work and feel free to send a donation his way as a way of thanks and support. With everything necessary downloaded and installed now it’s time to get to work. The first step of this process is to extract the Tasks app from the webOS Doctor. Using your compression app, open up the Doctor. 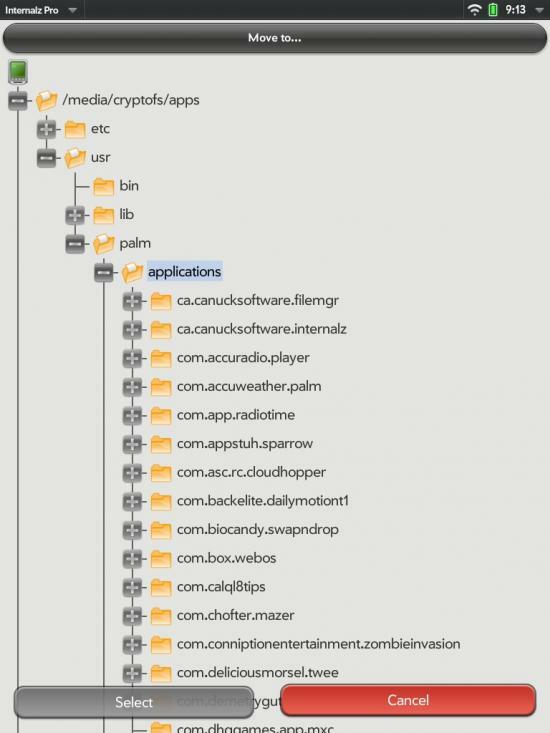 Once opened, navigate to nova-cust-image-roadrunner.rootfs.tar.gz\.\usr\palm\applications and find the Tasks app which should be a folder named com.palm.app.tasks, Once located, extract the entire Tasks app folder to a spot you'll be able to remember. Like your desktop. Now you will need to package this app into an IPK in order to install it on your TouchPad. The IPK is the file format for webOS apps, and wraps together all of the files needed to make an app an app. This is where that IPK Packager you download comes in. Open IPK Packager, load the com.palm.apps.tasks folder you extracted out of the Doctor, and click “Create IPK”. IPK Pacakager will package up the files into an IPK, just as the app and the button imply it will. With the IPK created you can either email the IPK to yourself or plug your TouchPad up to your computer drop the file onto it the old fashioned way. Personally, we prefer the emailing method - it's just faster than digging up a USB cable (you're charging via Touchstone, right? ), plugging in, dragging the IPK over, and then having to dig through the TouchPad's file system to locate the IPK to install. But merely copying or downloading the IPK isn't everything. You'll need to install it, which is easily accomplished with homebrew rock star Internalz or Preware. By default both Preware and Internalz will install the app to the /media/cryptofs/app/usr/palm/applications/ directory on your TouchPad. This will not work for a system app like Tasks, so don't autopilot through this one. Open Internalz Pro and move the install location of the tasks app to /usr/palm/applications/ directory (Note: Master Mode must be enabled in the preferences for Internalz Pro to do this). You may get a prompt asking if you would like to overwrite the existing files in which case you will need to select yes. Don't worry, you'll be fine. Once the file has been successfully installed, reboot your TouchPad and the old Tasks app should now be functional on your device. Well, mostly. Because this is an old Mojo app from your phone, the app will not run full screen - instead you get the virtualized phone interface with virtual gesture area. The app also will not give you notifications, nor can you set tasks to "active" with Exchange accounts as the field is missing (so make sure your tasks are synced properly on your webOS smartphone prior to installing the IPK on your TouchPad). If none of the above are deal breakers than the old familiar Tasks app is yours to use on the TouchPad. And there was much rejoicing. Source: webOS Nation Forums; Thanks for the tip gizmo21!